The new look Wii console will lose GameCube compatibility, which prompted some to presume the console will be more compact, but Nintendo has revealed the console is exactly the same size as its predecessor. The newly configured Wii console retains the same physical dimensions as the original Wii console: Height 157mm, Width 44mm, Length 215.4 mm. The Wii is pretty compact anyway, and at this stage in the machine's lifespan the process of designing and manufacturing smaller Wii consoles far outweighs any potential benefits. The tweaked Wii is down for an October release across Europe. I'll be interested to see what the price drop ends up being! In Europe prices are set by retailers, not Nintendo, so Nintendo UK won't be announcing any prices. Cue the repeat of hysteria about how Nintendo is destroying the world by removing Gamecube compatibility, etc., etc. Nintendo is destroying the world by removing Gamecube compatibility! No one even KNOWS it can play EVERY gamecube game... not sure why they kept it in as long as they did! I still own all my gamecube games but rarely play them. Wii games tend to feel last-gen, which makes GCN games feel 2 gen's ago. Burnout 2 on occasion, that's pretty much it. @winter123 some Gamecube games still look amazing. I played Wind Waker not that long ago and you could never tell it's 8 years old. The same goes for games like Mario Sunshine and Rogue Leader - they look better than a lot of Wii games! @James: Surely there's a recommended price though? I don't see how Europe is different to the USA or Australia with regards to pricing, in that retailers can charge whatever they want. 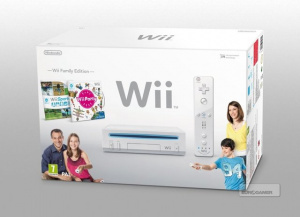 The new Wii and bundled software is expected to be around 99 Euros. But as stated previously, retailers are able to set their own pricing so it could be a little more, or even a little less. Well it will be physically smaller than the diagonally mounted configuration I guess. @Wheels2050 Nintendo sets the trade price to retailers and retailers can set whatever price they want. Nintendo is always clear about this as it got in considerable legal trouble years ago for price fixing Nintendo 64 games — it was fined €149m by the European Commission. The 3DS conference in Europe back in January just had "refer to our retail partners for price information", not even speak of a vague price. I'm guessing it wil be $99. Would be even cheaper if they'd just include a normal Remote i'd say (not a Remote Plus). So... they're improving the system by making it less functional? I really wouldn't expect the new SKU to be smaller, it is already pretty dang small. So this is so far an Europe only release. Interesting. @Nintenzo I can see this being $99 (or the equivalent in Euros/Pounds) seeing as how it has removed backwards compatibility. I still don't get why Nintendo make this re-design, there was nothing wrong with the current model. Making this one will only confused costumers between the original and the waterdown version and most ppl would rather want the original. All they need to do was to dropped the price of the current model, not made a similar but waterdown version of it. They really should have made it smaller like the PSOne and PS2 slimline models. Not that the current machine is huge but just imagine how cool it would be if they managed to squeeze it into something that was literally the size of a DVD box and maybe just a tiny bit thicker (think of the PS2 slimline but with an even smaller foot print). Bizarre. I suppose the reason is to reduce build costs but the fact remains this version of the console is inferior to the one thats been out for five years! Guys, it's only "inferior" to those of us that have Gamecube games, and those of us who do already own a Gamecube or the original Wii. The reduced price offsets it. There obviously is a market for people who would prefer to pay less for the console and not get features they won't be using anyways. If you're not a part of that market, just don't worry about it. If they gave it more internal flash memory, or made it able to do 720p like the developers use when they making games, then people might consider it more. However, that would defeat the purpose of lowering the price, so this is still fair. But how much cheaper? Anyway, I have already a Wii so I won't be affected! And to people who say: Why placing the original Wii vertically in the first place? Well, it was advertised that way. They didn't include the stand for nothing. And it just looks nicer. But above all: I heard that vertical standing devices work smoother! And don't we all want devices that work smooth? Besides, I wouldn't be surprised if Wii lenses stay cleaner when you place the Wii vertically. That way dust doesn't fall straight on the lense. That way reading dual-layered discs could be less of a issue! @17 They never claimed to be improving it. They're just removing GameCube hardware to cut costs. 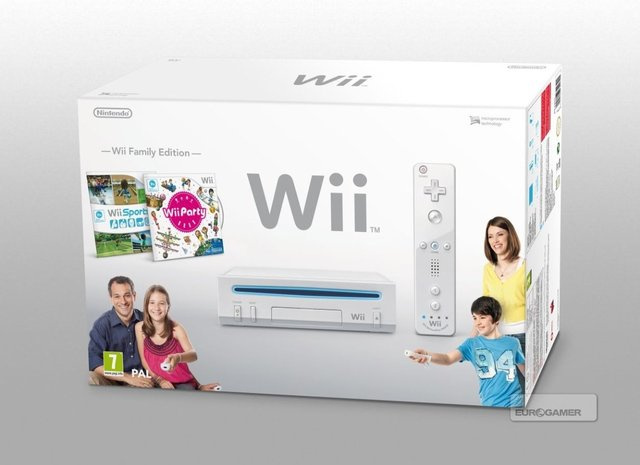 is the new wii coming in America? Don't think it can get any smaller,, it is already pretty small. If they wanted to make it smaller they'd really have to invest in manufacturing. I don't know if enough people would be interested in buying a smaller model to make up for these costs. And i still think they're getting ready for Wii U production by dropping the Gamecube support. It has to come sooner or later so when you can pair these preparations with providing a cheaper Wii, why not ? Only problem i see is with "harcore" gamers that held out on buying one so far and when you want your "Cuby" Wii repaired but Ninty can only offer you a new replacement model. Not necessarily happening but still worrying. Taking out Gamecube support is one of the worst things they can do at this moment and taking it out in the Wii U is gonna make things worse. I can understand taking out the mini DVD reader but not letting us use the GC controller at all? Thats horrible cuz the GC controller is classic and the new "Classic" controller is similar to PS one especially now that they've added pads on the sides. I knew something was up when Nintendo refused to released GC controller remakes for the Wii so that you can play hits like Brawl and Mario Kart with the classic feel of a GC controller with it being nearly a decade old. Now that might even turn people off to those game I know all of my Smash vets only like using the GC controller and dont like the other methods tho if they tried the classic controller im sure they'd give it a chance but the controller itself should not die just because its an old model. Sometimes I rly wished Nintendo actually listened to there fans once in a while. soooooo whats the point of this...? Their removing GCN, in prep for selling virtual GCN titles on the WiiU, probably. Removal of the GCN controller, & mem card slots/ports is probably also in part to make the console less hackable, & Nintendo console redesigns generally always omit a "feature"/"function" the original machine had, that may not necessarily have been used, &/or cost Nintendo extra to put in. The Nes 2 lacks a/v support. I'm forced to use rf on mine. The SNes, & N64 both had ext. ports on their original models. Etc. "Hey Mr. Nintendo-head-of-stuff-we-make, I think some people think the Wii would be cheaper if it didn't play gamecube games"
"But how will they play their gamecube games?" "These people don't have gamecube games sir"
A few sites are reporting a price of £79.99 for the UK. If I ever need to send my Wii in for repair again, they better not take GCN-compatibility out. I hate it when Nintendo takes only the bad cues from Sony, who cut PS2-compatibility out of more recent PS3s. Pffffffffft. I s till have my Gamecube when it first launched. This is interesting though.